necro- is a stem that means a corpse, dead both, dead tissue, death. necrovore: one who ingests death. We are all animals. However, we have made the social decision to call ourselves humans and use the word “animal” to indicate non-humans, thereby setting ourselves (as well as our preferences, tastes and desires) apart from other animals. This semantic twist provides us with peace-of-mind when we make decisions to objectify, control, slaughter, ingest and torture other animals. The idea that we, as a species, deserve more rights than other animals is called speciesism. Those who reject speciesism as a violation of the rights of other animals understand that the mistreatment of non-human animals is akin to racism, sexism, homophobia, ageism and classism—it is just another way for those in power to justify the abuse they exert on those they claim are inferior. Those who believe in animal rights, or animal liberation, reject the use of non-human animals for the benefit of human animals. An animal rights agenda maintains that non-human animals have a right to life that includes freedom from pain, torture and fear. As such, those with an animal rights orientation refuse to kill animals, eat animals, wear animals, experiment on animals or treat animals as property. They also avoid purchasing products or participating in systems that involve such treatment. 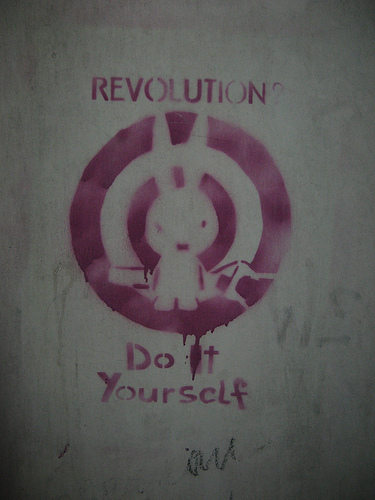 The ultimate goal is to create a shift in society such that all animals are liberated from oppression—meaning no animal is treated as property under the law, confined and tortured in laboratories or slaughterhouses or defiled and objectified as an aesthetic accoutrement to be worn by humans and labeled as fashion. 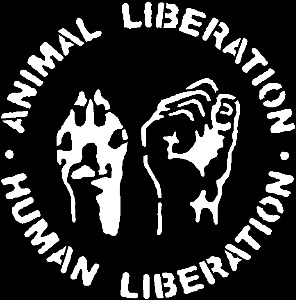 Animal welfare is an agenda sometimes confused with animal rights and animal liberation. Animal welfarists are those who accept the use of non-human animals to fulfill human desires but seek to minimize the pain and discomfort they experience. Animal welfare allows for people to pacify themselves with the belief that they are doing good while still continuing to exploit non-human animals for food, fashion, entertainment and other capitalist interests. Though animal welfarism rejects wanton cruelty, it leaves speciesism and hierarchical systems of power intact. One of the ways we can see how mistreated animals are in our culture is by way of our language. Through idioms (expressions, often culturally-specific) and adages (short memorable phrases), animal abuse slips into everyday language and is so normalized that it goes unnoticed. How can we combat this? We can stop using language that is violent toward other animals. 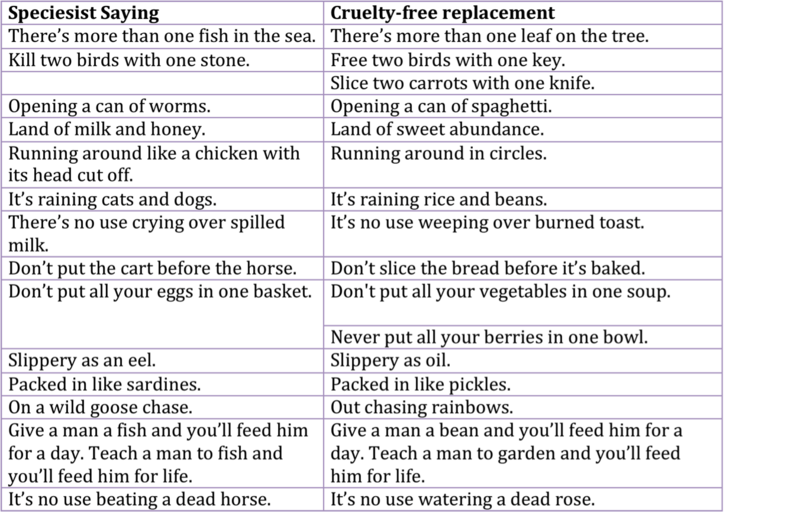 We can take this a step further and play with language, changing these phrases to fit a cruelty-free lifestyle. Colleen Patrick-Goudreau has an amazing podcast on this topic, check it out! 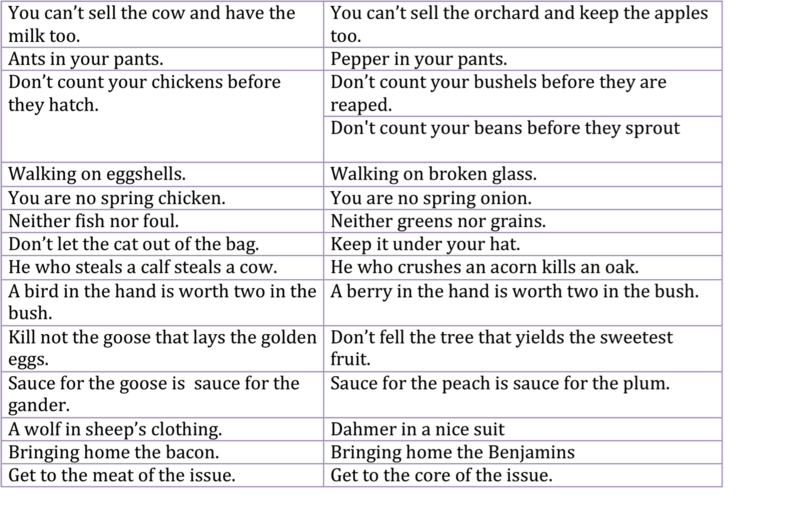 And below is a list of some possible replacements for old idioms and adages from various sources, including many friends and the cookbook Vegan Vittles. 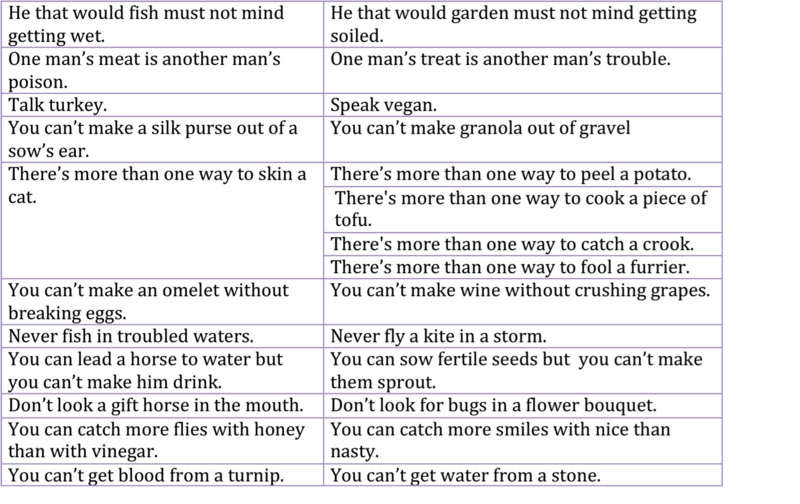 If you are ever in a pinch, though, you can check out this very clever, “Randomly-Generated Animal Friendly Idiom Editor” by Chris Marcum. The website of a public vegan cooking show co-hosted by Terry Romero and Isa Moskowitz; the authors of such fabulous books as Vegan Cupcakes Take Over the Word, Vegan Cookies Invade Your Cookie Jar, Veganomicon and Vegan with a Vengance. This website has recipes, a blog and how-to video clips! A reader-directed recipe website. Readers are great about commenting on what they’ve tried and how recipes turned out, making it a safe bet for finding successful recipes. A website that allows you to search for veg*n and veg*n friendly restaurants. The restaurants are added by users, so update it with your favorite places! A blog all about veggies 🙂 Each post is about a new veggie with plenty of vegetarian and vegan recipes attached. Vegan Essentials: Food, personal care products, clothing and more.